Last week was Eating Disorders Awareness Week. During this week I co-ran a fundraising event with a local Preston-based charity Support and Education for Eating Disorders (S.E.E.D). 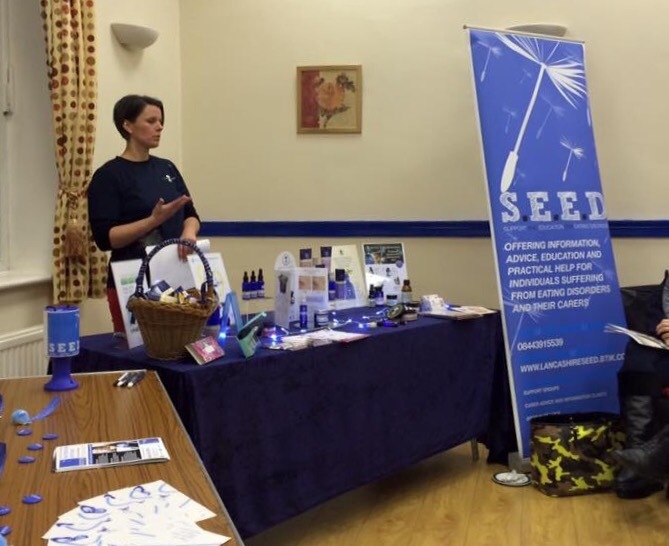 S.E.E.D is dedicated to raising awareness about eating disorders in Lancashire by providing information, resources, education, training and support for everyone affected by eating disorders and/or working with eating disorders. S.E.E.D acknowledges that the symptoms of eating disorders are an expression of deeper emotional need; they believe that people suffering can get better; that there is help available and this help should be freely accessible. The event was a shopping evening held at Howick House in Penwortham. We started off with drinks and nibbles, and then got started. I donated a reflexology voucher worth £35 as one of the raffle prizes, so began with a short talk on what reflexology is, how it works and some of the benefits it can have on general wellbeing. I then moved onto Neal’s Yard Remedies Organic, showcasing the natural and organic approach, and the ethical credentials of the company. We had a bit of fun with a “smell test”, guessing the scents of different essential oils, and learning about their health benefits. S.E.E.D’s very own Shelley Perry enjoyed a mini facial, a demonstration of the key facial products and their benefits for the skin. Shelley was very relaxed afterwards! We then tried various different products, many of which are my favourites such as the Wild Rose Body Elixir, Firming Body Cream and the Melissa Hand Polish. Afterwards everyone relaxed with the brochures and placed enough orders for me to donate £65 of my profits to the charity, and along with the other monies raised through the raffle and refreshments, a total of £165 was raised on the night. What a great result and everyone had such an enjoyable evening! If you are a local charity and would like to hold a similar event with me please get in touch. Watch out for another shopping evening with S.E.E.D this summer.